Insight Public Sector (Insight) simplifies IT procurement by providing the technologies, implementation skills and management expertise your organization needs. Our competitively solicited contract through OMNIA Partners ensures you receive Insight's best overall government pricing on our broad portfolio of products and IT service solutions. Contact Insight to learn more about how they can help your agency with public sector IT solutions. We deliver compelling capabilities with meaningful outcomes through Insight Intelligent Technology Solutions™. Managing your business should be as simple as possible. By streamlining the process of procuring, maintaining and replacing technology solutions, we take the hassle out of running your organization so you can focus on innovating your business. Our managed services offerings are expansive to help you build a cloud-first, mobile-first, next-generation workplace. 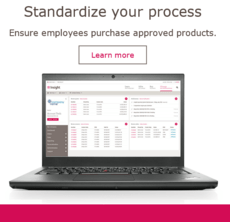 We'll help you drive productivity, simplify management and consolidate spending. Automation, self-service and governance can reduce your IT footprint while providing superior user experiences. Through Digital Innovation, our experts embrace rich data analytics coupled with deep expertise in the Internet of Things (IoT) and mobile app development. Leveraging our industry knowledge, intrinsic empathy and customer insights, we design and develop meaningful solutions that advance the ways customers live and work. The demands of business today can be a heavy burden. From managing existing workloads to preparing for future goals and modernizing your organization, your data center plays a critical role. Our Cloud + Data Center Transformation team will work with you to understand your business goals and objectives, provide recommendations and create a road map to help you achieve them. 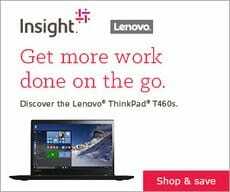 How do I place an order with Insight Public Sector? Yes. This contract has been competitively bid by a government agency. Through the Joint Powers Authority or an inter-local agreement, local governments can "piggy-back" this competitively bid contract through OMNIA Partners. This satisfies the competitive bid requirements in most states. See state by state laws on intergovernmental purchasing. No. 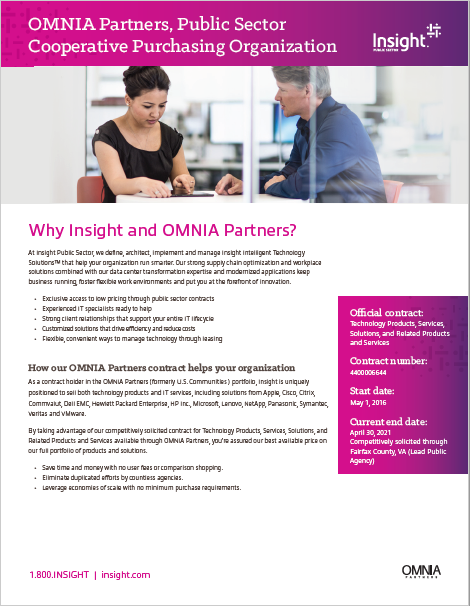 Contact your Insight Public Sector Account Manager to have the OMNIA Partners program linked to your existing account. Using Insight Public Sector and the OMNIA Partners program assures an agency they are getting a very competitive price on any size order. There are no costs, minimum quantity requirements or spend limits associated with using the Insight Public Sector OMNIA Partners program. The key value for the agency is resource savings. On average, OMNIA Partners participating agencies will save 5% over traditional procurement practices. Most agencies today are spread too thin. Agencies are downsizing administrative departments, and retiring or departing purchasing and maintenance positions are left unfilled. The OMNIA Partners program provides a mechanism to save the time and costs associated with obtaining quotes or preparing bids. The time savings allow the department to accomplish its work tasks more efficiently with the personnel on hand. How to Obtain OMNIA Partners Pricing? To obtain OMNIA Partners pricing from our suppliers, you must first register to establish your agency’s eligibility for the program. Registration is free and there is no obligation of any kind. During the registration process, you can request contact from any supplier(s) you would like. Any time after registration, just visit the “Products and Suppliers” page to request supplier contact. Each supplier you select will contact you to explain the special OMNIA Partners pricing and other exclusive benefits available to public agencies and nonprofits through the OMNIA Partners contracts. Once you have registered, you may also choose to purchase from a portion of our suppliers through the OMNIA Partners e-commerce portal which allows you to purchase from several suppliers at the same time. Is it possible to enter into a purchase or service agreement that has a term that extends past the current contract expiration date? Yes, because the agreement was set up in the current contract award period, all terms, conditions and pricing for any agreement executed prior to the end of the current contract award #4400006644 will be honored and remain in effect for the term of that agreement. This includes any and all Customer Facing Agreements (CFAs). Download the full list of Insight Manufacturers, Publishers and Suppliers by Category. Updated November 6, 2017. When every second counts, having the right technology can improve your speed and efficiency. Insight not only understands the unique demands of state and local entities, but we help you optimize resources and manage changing IT infrastructure requirements. How Will You Tag and Upload? 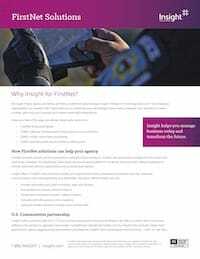 As an authorized FirstNet dealer, Insight provides first responders and the public safety community priority broadband connectivity during crises. FirstNet offers dedicated, prioritized connectivity for first responders who put their lives on the line with enhanced communication and highly secure, high-performance devices. The FirstNet network core's multi-layered defense provides a secure platform and is monitored by a dedicated Security Operations Center. FirstNet wireless coverage will reach more than 99% of the U.S. population with a robust set of LTE capabilities. Save with competitively-priced rate plans and wireless devices. We created an easy-to-use tool to help you find the perfect match — based on your needs and requirements. Just answer our questions to select the best notebook option to fit your needs. Use Insight's Memory Selector to find exactly which memory module you need for your systems to provide a custom solution for your business. Security breaches can occur at every educational tier and they’re popping up all over America. Learn how you can protect your school.